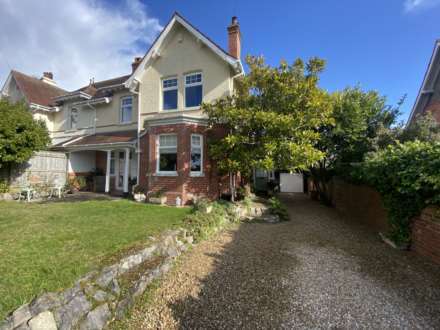 Offered for sale with NO ONWARD CHAIN and situated within this popular residential location is this extended 4 bedroom, 2 reception room and 2 bathroom, semi detached, 1930`s house with a Southerly facing rear garden. This gas centrally heated (from combi boiler) and uPVC double glazed property comprises, on the ground floor, of cloakroom, bay fronted living room, dining room, sun room, kitchen / breakfast room and office. On the first floor are the 4 bedrooms, en - suite shower room and family bathroom. Subject to gaining the usual planning consents, the loft could be converted to provide further living accommodation. There is an attached garage, ample brick paved, off road parking and the Southerly rear garden that backs onto the `old railway line` into Phear Park. An early appointment to view is strongly advised to avoid disappointment. Double doors leading to sun room. Fitted display cabinet. Radiator. Coved ceiling. Obscure glazed window to rear. White suite comprising low level WC and wall mounted wash hand basin. Tiled flooring. Coved ceiling. Walk - in bay window to front. Radiator. TV point. Coved ceiling. Obscure glazed window to rear. Modern white suite comprising double shower cubicle with thermostatically controlled shower unit, splash screen door and tiled splash backs. Low level WC. Pedestal wash hand basin. Heated towel rail. Inset ceiling lights. Extractor fan. Window to rear. Fitted wardrobe. Freestanding wooden shelving unit. Radiator. Coved ceiling. Window to front. Radiator. Coved ceiling. Obscure glazed window to rear. White suite comprising panelled bath with mixer tap and shower attachment, tiled to ceiling height. Low level WC. Pedestal wash hand basin. Radiator. Tiled flooring. Extractor fan. Coved ceiling. Single skin construction. uPVC double glazed window to rear. Power connected. uPVC double glazed external door to rear garden. The Southerly facing Rear Garden has a patio area adjacent to the property being ideal for outdoor dining and sitting during the fine weather. The remainder is then laid to lawn with shrub bed borders. Timber fence and hedge boundaries. Outside water tap. Timber shed / play house. Holly tree. From our prominent Town Centre office, leave the town going along Salterton Road. At Littleham Cross traffic lights turn left down Bradham Lane and then take the next left into Lovelace Crescent. The property will be found on the left hand side, clearly identified by our For Sale board.